Capture the magic of Christmas with a gift they’ll never forget! Santa writes letters to good girls and boys and includes an early gift too! Your child’s letter is personalized to include first name, city, state, and a personal accomplishment (optional). 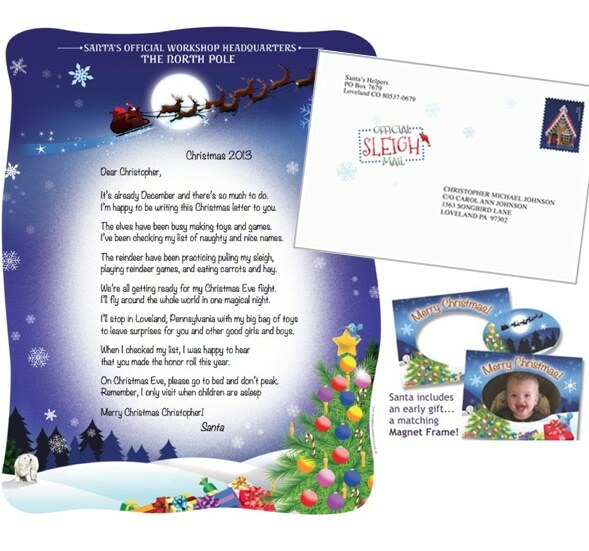 Santa’s letter and a matching magnet frame are sealed in an ‘Official Sleigh Mail’ envelope and mailed to your child’s very own mailbox. Capture the magic of Christmas with a gift they’ll never forget! Hurry! Order by December 12th for delivery before Christmas.